A flagship Windows 10 phone will be a long time coming. If all the excitement surrounding Windows 10 and its relationship with Windows phones has got you in the mood to try a Microsoft handset, then it looks like you're going to have to wait. Towards the end of Microsoft's recent press conference, executive vice president of the Operating Systems group Terry Myerson promised that flagship Windows phones were coming, in his words, "later this year". With MWC 2015 right around the corner (it begins on March 2), and Microsoft's annual Build conference in April there's a good chance we'll see some new Windows phone devices at the events, but the big guns are being kept for the end of 2015. With Microsoft making a lot of the convergence between Windows 10 devices it does make sense for the Redmond company to hold back its most impressive Windows phones to launch alongside its new operating system. 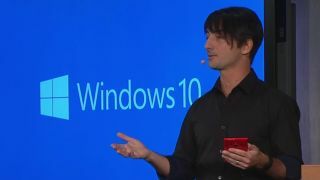 It's disappointing for anyone wanting to get the latest and greatest Windows phone, but it's clear Microsoft wants to show off Windows 10 on smartphones in the best possible light. That doesn't mean that other manufacturers won't launch flagship Windows phone devices earlier this year, but seeing as Microsoft is the main manufacturer of Windows phones, the chances of a flagship Windows handset showing up any time soon is pretty slim. Has Windows Phone just died?